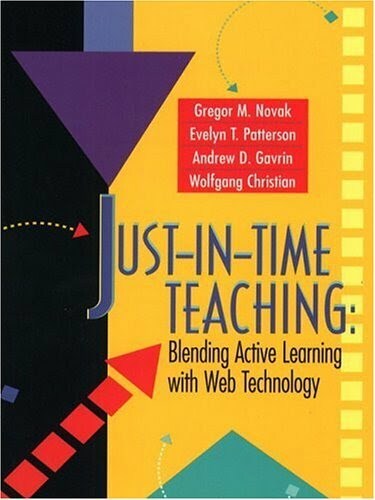 Just-in-Time Teaching is a strategy which combines the use of web-based materials with in-class activities in order to optimize student learning experience. The primary idea is to ask students preparatory questions which are due soon before instruction in order to garner an understanding of their initial knowledge state and use this information to inform in-class lesson. The classroom activities are typically tailored to address the common difficulties that are revealed by the preparatory questions students answered before class. After class, students answer exercises called Puzzles which build on the material learned in class and extend students’ knowledge. The preparatory questions target a variety of specific issues such as: developing the vocabulary, connecting different concepts, understanding the scope of applicability of equations, developing estimation skills etc. When employing this strategy, it can be very helpful to explicitly use student responses to the preparatory questions as this has the effect of giving students a feeling of ownership (i.e., the instruction is tailored to them) because the instructor discusses and addresses their ideas. Furthermore, because the students already worked on the preparatory questions before class, they come to class willing to engage with one another in order to improve their understanding (see for example, D. L. Schwartz, “A Time For Telling”). For more information, see Indiana University-Purdue University Indianapolis’ Just-in-Time Teaching website. The ELIXR project has developed several videos on the effective use of JiTT methods. The JiTT method was originally developed for teaching physics, but has been adapted to many other areas. The Science Education Research Center at Carleton College has assembled a list of resources for the JiTT method in various areas (Astronomy, Biology, Chemistry, Economics, Engineering, Geoscience, Physics, Psychology/Statistics). It also contains information about how to combine JiTT with other pedagogies. The Just-in-Time Teaching Digital Library contains materials from Biology, Chemistry, Geoscience, Mathematics and Physics.